You've found the “U.S. Shropshire Sheep Breeders” page here at Hobby Farm Wisdom! If this is the first time you have visited our site: Welcome! Shropshire is a breed of domestic sheep native to England that was developed by crossing local horned black faced sheep with certain white faced breeds. The result was a breed of medium sized sheep that was naturally polled and produced good quality wool and meat. 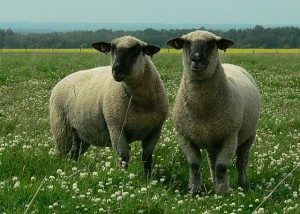 Shropshire sheep quickly became a popular breed due to their ability to adapt to live successfully on different types of pastures, hardiness in difficult climates, longevity and prolificacy. During the 1920s and 1930s, the Shropshire was the most popular breed of sheep in the United States. Today, this breed is raised primarily for meat. Shropshire’s are hardy and meaty with an ability to feed out to choice grade at an earlier age than most.